From Grace Kelly’s refined aesthetic to Madonna’s rebellious sensibilities, the following fashion icons have left us with an unforgettable sartorial legacy. Not only did they inspire women (and men) of their own generation, but each of their enduring influences continues to make us all want to replicate their looks. Keep scrolling to see which fashion icons made the cut. 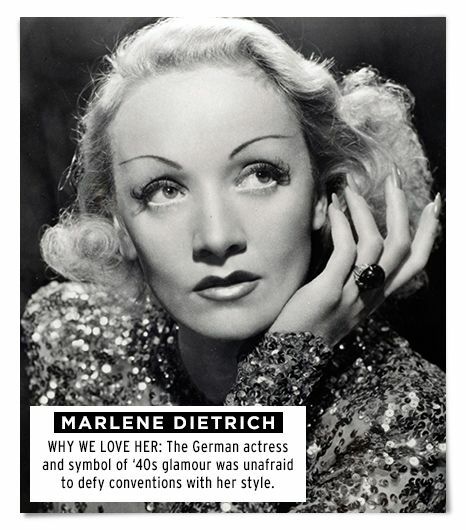 From smartly tailored pantsuits to fedoras and bow ties, Dietrich’s tastes leaned heavily toward menswear dressing, yet the silver screen star of the ’20s and ’30s still exuded an undeniably feminine sensuality. Legendary Swedish actress Garbo popularized a slightly androgynous look—comfortable, classic, unfussy—that reflected her no-nonsense personality as well. This actress channeled a decidedly powerful look in the ’40s, one that eschewed anything girly or fussy in favor of masculine-inspired pieces, like tailored blazers, pleated trousers, and loafers. To many, Bacall’s look in the ’40s, which alternated between sharp suits and slinky evening gowns, epitomized all-American elegance. Even before she became a real-life princess, Kelly was known for her ladylike ’50s look, which consisted of pearls, swing coats, and feminine dresses that are timeless even today. Hepburn’s signature style smacked of minimalist chic. Off duty, she often enhanced her signature pixie cut with impeccable yet casual separates, like turtlenecks, cropped pants, and ballet flats. Monroe’s Hollywood image was that of sultry bombshell, a reputation she fostered by wearing skintight dresses and va-va-voom tops that flaunted her figure. Although Seberg was actually from small-town Iowa, the actress’s penchant for Breton stripe T-shirts, crisp blouses, and slim trousers came to personify everything cool and sophisticated about Parisian style. The former first lady was the picture of classic, all-American polish. Even after she remarried to Greek tycoon Aristotle Onassis, shifting her look from pillbox hats and shift dresses to oversize sunglasses and head scarves, the public continued to remain fascinated by her. The British model’s gamine look—lanky limbs, a pixie crop, and doll-like eyes, not to mention the Mary Quant minis and mod dresses she often wore—made her a poster child of the ’60s. Hermès’s renowned Birkin bag is named after the British actress, who captured a free-spirited, bohemian-inspired style in the ’60s—think slightly sheer blouses, micro shorts, and flared jeans—that felt decidedly French. The word “fierce” is part of Beyoncé's vernacular now, but back in the ’60s, it belonged solely to Ross. The Supremes singer’s name is synonymous with glitz and glamour, thanks to her bedazzled outfits, bigger-is-better jewels, and voluminous coif. We can’t think about Dunaway without envisioning the actress’s signature beret hats, short-sleeve sweaters, and midi skirts, the elegantly appealing look she sported in 1967’s Bonnie and Clyde and also off the clock. Late-’60s style icon Getty consistently looked the part of free spirit in colorful prints, kaftans, and furs, a style that’s undoubtedly inspired modern-day fashionphiles such as Sienna Miller and Kate Moss. Often spotted in turbans, sequined pieces, and truly fabulous hats, Jagger was fashion-forward even for her time. The model—and Studio 54 fixture—embraced the bold, flashy outfits that cemented her fashion icon status. For the paramour of more than one member of the Rolling Stones in the swinging ’60s, it’s only fitting that Pallenberg commandeered a rock ’n’ roll sense of style: swingy mini dresses, wide-brimmed hats, fringed vests, and kohl-rimmed eyes. Hutton’s approach to dressing is best described as effortlessly natural, much like the gap-toothed smile that became her beloved trademark. The actress and supermodel wore button-downs, slouchy pants, and simple T-shirts with an enviable laissez-faire attitude. Who could forget Keaton dressed in a vest, tie, and bowler hat in her famous role as Annie Hall? The actress’s borrowed-from-the-boys style revolutionized the way women dressed in the late ’70s and early ’80s—and we’re thankful for it! As the frontwoman of Blondie, Harry is punk royalty, and her wardrobe reflected that with DIY-inspired, shredded rocker T-shirts, black jeans, and tough biker jackets galore. Madonna has continued to reinvent her look over the decades, but it’s the Material Girl’s first appearance on the scene—wearing conical bras and studded bustiers in the ’80s—that make her a fashion trailblazer. Up next: The fashion staples that French women swear by. This post as been updated by Gina Marinelli.